The Vicem 65 IPS Classic, the Turkish-built yacht with classic Down East lines, is on display at the Palm Beach International Boat Show 2019. This Vicem’s the first in that size range to be fitted with the Volvo Penta IPS system. 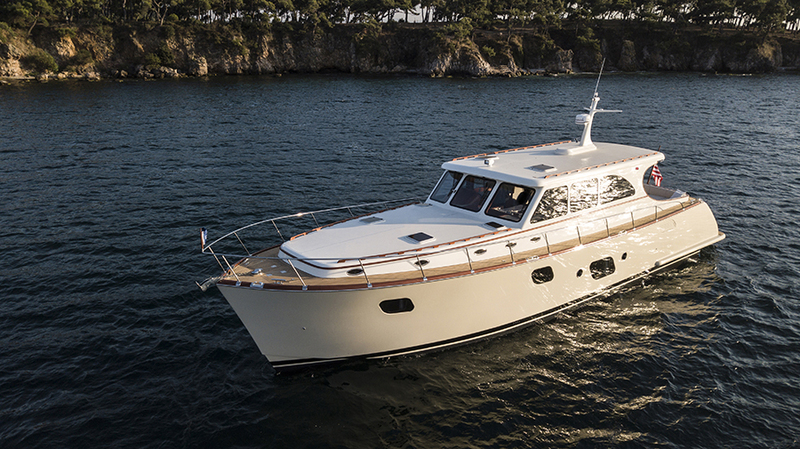 The Vicem 65 IPS classic can be built with three or four staterooms and three heads. Below, the master stateroom is midships and full beam, with a walkaround bed and a large ensuite head with shower (7’5” feet of head-room). The VIP cabin is forward with a walkaround bed and en suite head and shower; the third stateroom with two berths is on the starboard side, also with a head and shower. The 65 IPS Classic on display at FLIBS 2018 was a four cabin version and has an average of 7 feet of headroom. Powered by twin 800-hp Volvo Penta diesels with IPS 1050 pod drives, the Vicem 65 IPS Classic cruises at 23 knots – with a range of about 420 nm – and tops out at 26 knots. Furthermore, the yard offers two other Volvo Penta engine options: 2xIPS 1200 or 2xIPS 1350. The building technique used to create the Vicem 65 IPS Classic is the cold molded process, west system epoxy. A millenary, unique construction technique which embodies all the construction methods of the Turkish historical marine tradition; the cold molded process west system epoxy a modern procedure different from traditional boat building. Based on engineered wood construction, cold-molding uses laminated mahogany (coming from managed forests) and a specific formulated epoxy resin to create the hull, decks and principal superstructures. On a strength-to-weight ratio, mahogany is stronger than fiberglass. For more than 28 years Vicem Yachts is world renowned for using traditional construction styles in mahogany, and has successfully delivered over 150 yachts. Mahogany is a renewable resource, reducing our carbon footprint. Every employee at Vicem is a qualified carpenter, designer or engineer who goes that extra mile to ensure the highest quality in their workmanship. All the wood on a Vicem hull, keel, chine, sheer, frames, and beams is coated with epoxy resin which serves as a moisture barrier. The exterior of the hull and interior of the entire bilge and engine room area are also coated with a layer of E-glass cloth and epoxy resin, finished with epoxy fairing compounds, epoxy primers, and poly-urethane paint.